Washington County is a county located in the U.S. state of Minnesota. As of the 2010 census, the population was 238,136, making it the fifth-most populous county in Minnesota. Its county seat is Stillwater. The largest city in the county is Woodbury, which had a population of 61,961 at the 2010 census. 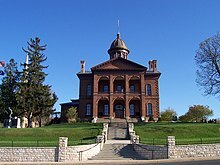 The county was established in 1849. After the forests were depleted, the economy of Washington County became primarily agricultural. With the growth of neighboring Ramsey County and St. Paul, some of Washington County developed based on tourism and recreation, as with Mahtomedi and Landfall. Late in the 20th century, the population greatly increased with the suburban expansion of St. Paul. According to the U.S. Census Bureau, the county has a total area of 423 square miles (1,100 km2), of which 384 square miles (990 km2) is land and 38 square miles (98 km2) (9.1%) is water. It is the fourth-smallest county in Minnesota by land area and fifth-smallest by total area. As of the census of 2010, there were 238,136 people, 87,446 households, and 64,299 families residing in the county. The population density was 607 people per square mile (235/km²). There were 87,446 housing units at an average density of 223 per square mile (86/km²). 39.4% were of German, 14.4% Irish, 13.0% Norwegian, and 9.9% Swedish ancestry. There were 87,446 households out of which 38.6% had children under the age of 18 living with them, 60.6% were married couples living together, 9.5% had a female householder with no husband present, and 26.5% were non-families. 21.5% of all households were made up of individuals and 7.3% had someone living alone who was 65 years of age or older. The average household size was 2.67 and the average family size was 3.14. In the county, the population was spread out with 23.5% under the age of 18, 6.2% from 18 to 24, 32.90% from 25 to 44, 28.7% from 45 to 64, and 10.3% who were 65 years of age or older. The median age was 38 years. For every 100 females there were 98.02 males. For every 100 females age 18 and over, there were 97.03 males. The median income for a household in the county was $79,735, and the median income for a family was $92,497. The per capita income for the county was $36,786. About 5.2% of the population was below the poverty line. According to the 2007-2011 American Community Survey, of the county's population 25 years and over, 1.4% had less than 9th grade education, 2.8% held 9th to 12th grade with no diploma, 23.6% had High school graduate or equivalent, 22.2% held Some college with no degree, 27.0% had bachelor's degree, and 13.0% earned Graduate or professional degree. As of the 2000 census, there were 201,130 people, 71,462 households, and 54,668 families residing in the county. The population density was 514 people per square mile (198/km²). There were 73,635 housing units at an average density of 188 per square mile (73/km²). The racial makeup of the county was 93.63% White, 1.83% Black or African American, 0.39% Native American, 2.14% Asian, 0.03% Pacific Islander, 0.60% from other races, and 1.37% from two or more races. There were 71,462 households out of which 41.60% had children under the age of 18 living with them, 64.80% were married couples living together, 8.50% had a female householder with no husband present, and 23.50% were non-families. 18.70% of all households were made up of individuals and 5.40% had someone living alone who was 65 years of age or older. The average household size was 2.77 and the average family size was 3.19. In the county, the population was spread out with 29.40% under the age of 18, 6.80% from 18 to 24, 32.90% from 25 to 44, 23.20% from 45 to 64, and 7.60% who were 65 years of age or older. The median age was 35 years. For every 100 females there were 98.80 males. For every 100 females age 18 and over, there were 96.80 males. The median income for a household in the county was $66,305, and the median income for a family was $74,576 (these figures had risen to $78,067 and $90,867 respectively as of a 2007 estimate). Males had a median income of $49,815 versus $33,804 for females. The per capita income for the county was $28,148. About 2.00% of families and 2.90% of the population were below the poverty line, including 3.50% of those under age 18 and 4.10% of those age 65 or over. Like all counties in Minnesota, Washington is governed by an elected and nonpartisan board of commissioners. Each commissioner represents a district of approximately equal population. Washington County is divided among three congressional districts. Northern Washington County is represented by Minnesota's 6th congressional district (CPVI R+10), central Washington County by Minnesota's 4th congressional district (CPVI D+11), and southern Washington County by Minnesota's 2nd congressional district (CPVI R+2). Washington County has had three locations listed as Environmental Protection Agency Superfund sites due to soil and groundwater contamination. The Baytown Township Ground Water Plume and the Oakdale Dump are currently listed, while the Washington County Landfill was cleaned up and removed from the Superfund list in 1996. Washington County records are available for research use. They include school records, Welfare Board records, County Auditor records, Probate Court files, Stillwater Municipal Court files, birth and death records, marriage, naturalization, deed records, and agency histories. ^ "Minnesota Government Series, State Counties". Minnesota House of Representatives. Retrieved March 18, 2008. .
^ Upham, Warren (1920). Minnesota Geographic Names: Their Origin and Historic Significance. Minnesota Historical Society. p. 568.